Selecting an engineering material for any engineered product is a regular process in any engineering design task. Material selection has a special importance in engineering design tasks as it will define the performance of the product designed. Material selection process is not so simple; it usually consists of many steps which mostly depend on the importance or value of the produce being designed. In material selection process for any engineering design task, establishing selection criteria is first step in which a selection criteria for material selection is establish and usually it consist of properties required to full fill design requirements. Following are the some of the criteria on which all materials will be selected. Mechanical properties have first position in selection criterial as they will define mass, strength and performance of the product. After mechanical properties manufacturing properties of material are test as they will define the proper manufacturing process and the cost of the manufacturing process of product and thus will affect the final cost of the product. Environmental properties are third in selection criteria as they will define the environmental effect of material from which the produce will be manufacturing. It is very important to select a material that effect the environmental lest during its life span and death period. Economical aspects material will define the cost of raw material and will have great impact of the final cost of the product. Material cost should be kept as low as possible in order to keep the final product low and make the product cost effective. Availability issue is also very important is material selection the selected material should be easily available in local market. This will reduce the transportation cost and will save a lot of time required for material transportation. There are slot of materials that have the required potential to be used as base material for a particular product production. It is very difficult to study each and every material available for product. So make this process easy, usually three to four materials are short listed form all available materials and this is done by studying similar products. In most of cases first material is selected for the production of product but in some case first two material or one which easy available is used for production. Material selection process will be conducted for gears based on the instruction provided above. Mechanical properties have first position in selection criterial as they will define mass, strength and performance of the product. There are about 22 mechanical properties that any engineering material can have and from all of these properties following the few which will affect the performance of the gear. With increase awareness in environmental protection selecting material which did not affect or have least affect from the available material on environment is becoming more important. Following are some of environmental properties for which any material should have minimum value. Embodied energy is energy used for any material during its extraction, refining, manufacturing, transportation and decomposition. More the embodied energy any material will have more it will affect the environment. CO2 foot prints means the amount of carbon dioxide any material will release during its life time. A good material should have minimum CO2 foot prints. Material selected for the manufacturing of any product should be easily available in local market in order to minimize the transportation cost associated material. There are a lot of materials that can be used for manufacturing gears but out of all those material following three are the most common materials used for gear manufacturing. As gears are mainly manufactured by machining process called hobbing, so only machine-ability will be consider. Based on the evaluation shown above Alloy Steel is the best material for this project as it has highest yield strength, high wear resistance, lowest embodied energy, lowest CO2 foot prints and lowest cost. 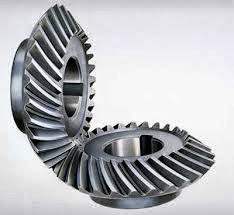 So Alloy Steel is the material select for manufacturing of gears.